Tacoma is home to the Museum of Glass, a museum that is – as you might guess from the name – all about glass, which makes it unique not only in Tacoma, but it’s one of few such museums in the world. Opened to the public in 2002, the stunning building was designed by a team of architects and engineers led by internationally-known architect Arthur Erickson. Its sleek, four-story structure offers several levels of outdoor plazas. Reflecting pools and seating areas make these plazas perfect for relaxing and enjoying views of the Thea Foss Waterway, the Tacoma Dome and Mount Rainier. A tilted 90-foot-tall steel cone, reminiscent of the sawmill wood burners of old, counterbalances the horizontal lines of the building. All in all, the Museum of Glass is a stellar place to visit either on its own or as part of a wider Tacoma museum tour as it’s located near several other museums. The highlight of a visit to the Museum of Glass is a watching glass artists at work in the hot shop amphitheater, which is located within the metal-clad cone. The hot shop is open to the public every day the museum is open (but it does close for lunch). Watching glass blowing live is fascinating and a learning experience as there’s usually an artist with a microphone who will explain what’s going on and answer questions. Also watch for visiting artists as some pretty major players in the glass world come through here. Museum exhibitions feature glass art by Dale Chihuly, of course, but this is also a place to expand your knowledge of glass artists from around the world. Displays focus on 20th and 21st century glass and bring in pieces both from the museum’s permanent collections as well as temporary exhibitions – so if you visit more than once, you will likely see something new. The Museum Cafe is a fine place to grab a bite before or after you tour the museum. It serves up Argentinian street food-inspired fare in the form of salads, quinoa bowls, wraps and sandwiches, as well as a full menu of sandwiches, sides, soups and snacks like baked empanadas. If you’re looking for a bit of glass to take home for yourself, The Museum Store is the perfect place as it has everything from small and affordable glass trinkets up to fine art, as well as items for kids, books and more. It almost feels more like a glass gallery than your typical gift shop. In addition to viewing the museum's exhibitions and collections, you can enjoy the Museum of Glass's education and outreach programs, which include family day programs, classes and lectures, a hands-on art studio, films and performances, workshops and symposiums and gallery talks. The Museum of Glass began in 1992 with a conversation between two friends, Dr. Phil Phibbs and Tacoma-born glass artist Dale Chihuly. Dr. Phibbs had the thought that Tacoma should have a glass museum as Western Washington – and Chihuly in particular with both his artwork and his co-founding of the Pilchuck Glass School – had played such a role in the studio glass movement. Dr. Phibbs took his idea to the Executive Council for a Greater Tacoma and pitched it, and the timing of his pitch lined up perfectly with the city working on a redevelopment plan for the then heavily contaminated and defunct Thea Foss Waterway. Such a thing as a glass museum would make a fantastic anchor for the redeveloped Thea Foss Waterway. Even then, the museum did not happen overnight. By the mid-1990s, the site for the museum was secured by the city. And while the initial idea was a museum focused on the works of Chihuly, Chihuly suggested the museum expand to include glass artists everywhere. And that’s when things really started to come together. In September 1997, Canadian architect Arthur Erickson revealed the museum’s design, including the museum’s most recognizable feature – its tiled cone. Construction started in June 2000 on the museum and the adjacent Bridge of Glass, which connects downtown to the Museum of Glass, began construction in July 2001. Both opened on July 6, 2002. The Museum of Glass is located at 1801 Dock Street in Tacoma. You can find parking near the museum on Dock Street or park in in the underground lot adjacent to the museum with an entrance on Dock Street. The underground lot does have parking fees. If you want to park for free, you can park at the Tacoma Dome and take the Link light rail to the Union and S. 19th Street stop. This will put you in front of Union Station, which you can go behind, cross the Bridge of Glass, and walk down to the Museum of Glass. The Museum of Glass is part of Tacoma's Museum District, making it a place where you can park once and enjoy a whole day of interesting attractions. 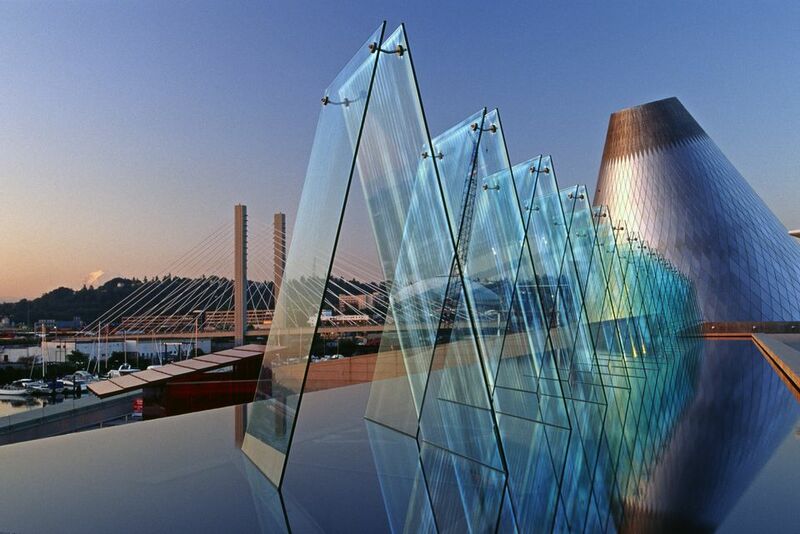 The Bridge of Glass links the waterfront Museum of Glass to the attractions on the south side of Interstate 705, including the Washington State History Museum and the Tacoma Art Museum. Crossing the bridge is an ideal complement to visiting the museum as it’s filled with artwork by Dale Chihuly. The Bridge of Glass was developed by a partnership between the City of Tacoma, world-renowned glass artist Dale Chihuly, and the Museum of Glass. The 500-foot bridge features one of the largest outdoor installations of Chihuly glass, valued at approximately $12 million. And since the Bridge of Glass is outside of any museum, admission is free. On the other side of the bridge is Union Station, the Washington State History Museum and Tacoma Art Museum – all worth visiting. A little farther afoot and near the Tacoma Dome is LeMay – America’s Car Museum, which is a must for car aficionados. And if you’re looking for something to eat, restaurants line Pacific Avenue (the street just on the other side of the Bridge of Glass). The Harmon Brewery has pizzas, sandwiches, salads and beer. Indochine serves Asian fusion food in a beautiful setting. Coffee shops like Starbucks and Anthem are also a fine way to wrap up your time in downtown Tacoma.